I write for fun, and don't envy those who write for a living. Or bloggers, who write routinely whether they feel creative or not. I understand writers are supposed to have a writing discipline. Mine is fairly nonexistent. And I don't like writing about writing, so this is all you get. NEW!!! 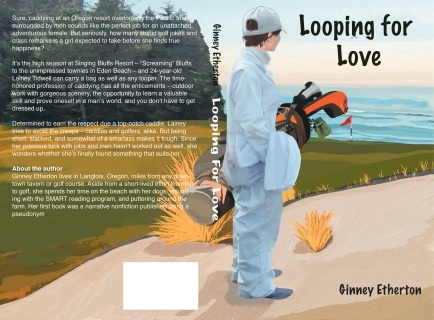 Looping for Love is now available for Nooks ... go to Smashwords.com, a limited time offer, $1.59. Lainey Tidwell, intrepid disciple of the distinguished caddie profession, strives to live up to the ideal. The reality, however, is a trap of chauvinistic, despicable practices that aren’t up to par. Guest assignments at Singing Bluffs Resort aren’t in full swing yet, more bag-packers are showing up every day, and getting a loop has become a nasty business. But at least the weather is better. So far, Lainey’s smarts have kept her out of serious scrapes, but it’s her smart mouth that could get her fired. That, and her foray into undercover work. Watching Lainey’s back is an unintentional and unlikely team of cohorts. Whether she likes it or not. Happy hour with the townies, an uncrowded beach, and an understanding boyfriend all help to ease her anxieties. But Lainey wishes that falling-into-place thing that everyone talks about would just get here already. She was prepared for the storms. But it’s the calms that could crush her. As her first season as a professional caddie winds down, Lainey Tidwell struggles to keep her dream alive at Singing Bluffs Resort. She may have a knack for guiding golfers around hazards on the links, but the unpredictable, nervewracking bouts of low-season blues are harder to avoid. Worries about money, men, and her unchecked mouth take their toll on this independent, yet conflicted, scrapper. Like a golfer with the yips, Lainey can’t shake doubts about caddying all winter at a small town coastal resort. 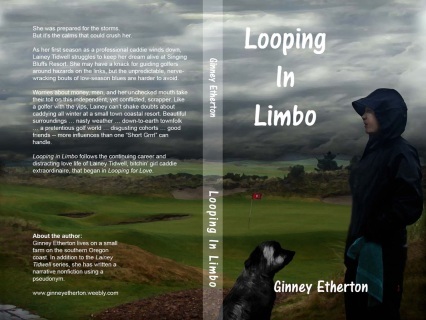 Beautiful surroundings …nasty weather; down-to-earth townfolk … a pretentious golf world; disgusting cohorts … good friends; more influences than one “Short Grrrl” can handle. Looping in Limbo follows the continuing career and distracting love life of Lainey Tidwell, bitchin’ girl caddie extraordinaire, that began in Looping for Love. Sure, caddying at an Oregon resort overlooking the Pacific and surrounded by men sounds like the perfect job for an unattached, adventurous female. But seriously, how many stupid golf jokes and crass remarks is a girl expected to take before she finds true happiness? It’s the high season at Singing Bluffs Resort – “Screaming” Bluffs to the unimpressed townies in Eden Beach – and 24-year-old Lainey Tidwell can carry a bag as well as any looper. The time-honored profession of caddying has all the enticements – outdoor work with gorgeous scenery, the opportunity to learn a valuable skill and prove oneself in a man’s world, and you don’t have to get dressed up. Determined to earn the respect due a top-notch caddie, Lainey tries to avoid the creeps – caddies and golfers, alike. But being short, stacked, and somewhat of a smartass makes it tough. Since her previous luck with jobs and men hasn’t worked out so well, she wonders whether she’s finally found something that suits her. Click page tabs at top to read samples from each book.